Lighthouse is maintained by the Canadian Coast Guard but it is de-staffed. It shows a flashing white light and there is a fog horn. The light is now a white circular fibreglass tower. Sources: Where Broad Atlantic Surges Roll. Philip L. Hartling. Formac Publishing, 1979. Conversation with Murial Wall. 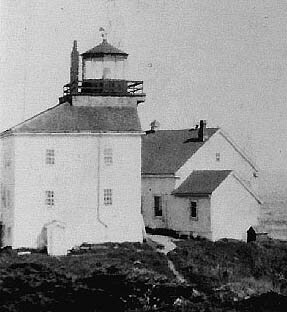 The first lighthouse was a house 35 feet high with the lantern on the roof, erected in 1846. It stood on the eastern end of the island. The building was painted white with two black balls placed horizontally on the gable facing S.S.W. The revolving white light, 70 feet a above high water, was most brilliant every two minutes. In clear weather it could be seen for 12 miles. In 1860, keeper Simon Fraser drowned on his way from Beaver island to Port Dufferin. There are several contemporary accounts of this tragedy. Fraser left the island early in the morning of February 10, expecting to have a fine time visiting. At about 4 PM he was observed trying to work his small whaler at the mouth of the harbour. The water was freezing, and there was ice inshore. Fraser was caught. William Whitman and his two sons manned their boat and tried to get out to him, but it was impossible. It was with great difficulty that they succeeded in getting back to shore. Night came on and Fraser had to be left in his perilous condition. At about 11 PM, the wind came up strongly from the NW, with clouds of sleet and intense cold. Once more Whitman, accompanied by his sons and a Captain Balcam manned their boat because the rising wind had dispersed the ice to seaward. They succeeded in searching the islands in the harbour hoping that Fraser had reached one of them. They found nothing. They went back and got a larger boat and a stronger crew. They went out to sea as far as they could and were out searching nearly all Saturday. The search went on for several more days, but Fraser was not found. It was presumed that he had been taken out to sea in the ice on the Friday night and perished. The community was dismayed at Simon Fraser's death because he had been well liked. His son Robert succeeded him as keeper. A combined dwelling and lighthouse was erected in 1914-15. In 1986 the wooden tower was destroyed and replaced by a circular white fibreglass tower which is shown on the Intro Page. 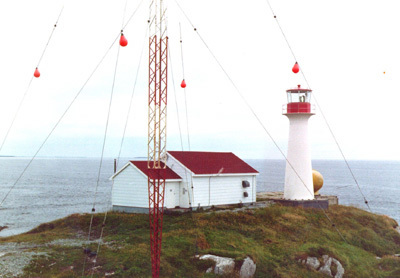 The light was automated in 1987. 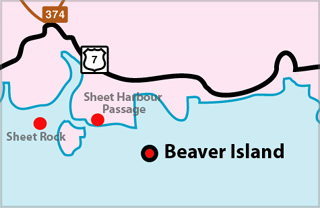 Beaver Island is a small island lying 6 miles off the coast of Nova Scotia between Sheet Harbour and Port Dufferin. It is actually composed of two islands. You can wade between them at low tide.